Humor : I once killed a man for wasting paragraphs. As our heroes began their journey out that morning, they were greeted by a beautiful countryside path stretching ever forward toward the mountains, and toward the small town of Marrowbrook in the east; the nearest settlement to the castle of the dark force enslaving Cellus' land. 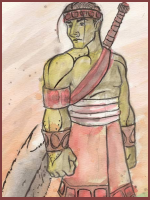 Cellus looked around at the adventurers with a smile, she was sure that with the new help she and Burk had brought back, the evil that had corrupted her homeland didn't stand a chance. "Okay, just so I'm clear on this, we're going to storm into some guy's castle and beat up a bunch of walking bones?," Knuckles inquired, still trying to get his head around the situation. "Sort of," Burk replied, "We'll stop for supplies in Marrowbrook first, and once we get there, we've got to decide how to get into this place." 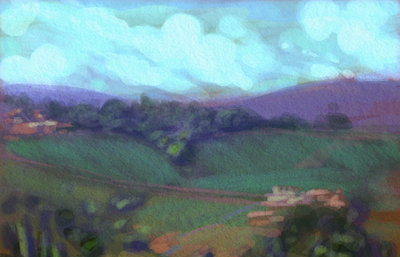 "Well spoken," Tal nodded, "Heard I did, stories of Marrowbrook Castle as a child. A dark and dangerous place it was, well before the arrival of the evil that has so enslaved it, and filled with many strange traps." "It must also be taken into account that the undead, by their very nature, do not exist in the natural order," Brother Light chimed in, "Something has created these abominations, and given the scope of their expansion, it was either someone very powerful or very foolish." Cellus nodded solemnly, "Yeah, it would be a good idea to make sure we're entirely prepared to take on everything that might come our way." she said looking in the direction of the village, a look of determination on her face. The journey to Marrowbrook mostly consisted of similar such conversations, occasional horseplay between Knuckles and Burk, and reminiscing over how good things used to be in the Plainterra on the part of Tal, Burk, and Cellus. For reasons known only to themselves, Kage and Cerys were silent for most of the trip; expected of Kage but uncharacteristic for Cerys. When the heroes arrived at Marrowbrook, all idle chatter fell silent, and the sheer, ominous feeling that permeated the town sent a chill down everyone's spine. "So, this is Marrowbrook...?," Knuckles steeled his nerves, glaring forward at the town and the dark castle in the mountains beyond. "Hai," Tal narrowed his eyes at the sight before him, "It was." "Things are worse than ever down here," Burk replied gravely just behind Tal, "When we left, the bad feelings were only half as bad." "I believe it is time we found shelter," Brother Light said briskly, an unusually tense stare radiating from his normally friendly face as he began walking toward a pub without a name. Cellus follwed after Brother Light treading lightly as she viewed the seemingly abandoned village, "Brother Light, is something the matter?" she asked quietly, resting a hand on his shoulder. Stopping abruptly at her sudden touch, Brother Light spoke without turning around, his shoulder clearly tense, "Cellus, are you familiar with the strange case of the town of Eavendale?" Cellus kept a hand on the preists shoulder as she stepped around to look Brother Light in the face, "No, should I know about it?" she asked tenetively. Brother Light shook his head with a sad and distant look in his eyes as he explained, "Most people do not remember it, or have chosen to pretend it never happened, but I could never forget..."
"It happened twelve years ago," he began, "I was a young deacon following my father on his now-famous pilgrimage around Norweist. We had stopped for a time in the small town of Eavendale, where my father had begun administering, when reports of a foul odor coming from an old mill just outside town began to circulate in the local grapevine. Fearing some sort of spill, some of the men from the town organized to look into the matter. They returned, in a manner of speaking, but only their bodies, and those soulless, rotten shells attacked in the middle of the night, dragging their former friends and family from their homes and slaughtering them for all to see. My father exorcised the place, putting an end to the killing, but I have never forgotten the terrible feeling that it left behind. I can say for certain that evil is with us now." Cellus closed her eyes and stretched out her senses, "I feel a presense too, and it means us no good I believe," she said with a shudder. "We'd best be on our guard for anything," she called to the group at large. Breaking out of the quiet trance Cerys was in, being in awe of the citys landscape and outlying area, he gets a small chill to bring him back to reality. Hearing about them talking about the spirits and things he remembers the ghost that appeared and possessed Molly that time he met Tal for the first time. "So i take it we are going to have to deal with something like a ghost of some-sorts... or will they be something a little more like zombies..."
"How about vampires?," a familiar voice retorted as an old friend strode forward from the shadows, "Once again, it seems I am the bearer of distressing news..."
"Hey hey! Welcome back Spooky!," Knuckles grinned, momentarily forgetting the situation until 'Spooky' shot him a cold glare, straightening him up, "Oh, right... vampires?" With an inquisitive raise of his brow, Tal vocalized what must have been the thoughts of Cerys and Brother Light, "Where has Vincent gone?" "As I told you, the news is bad," Nevara looked askance, a trace of guilt mingling with her normally brooding visage, "You already knew that I had taken Vincent away to a place where his vampirism could be kept in check until he learned to contain the hunger on his own..."
"In Nocturne, a vampire's thirst cannot kill him," she explained, "But it still affects his mind. Unfortunately, this sanctuary comes at a higher price; a day to the mortal realm is as a year in Nocturne. Vincent continued to follow the calling of Anubis, hunting down evil souls in the darkest of worlds, but over time, Mezerella's death plagued his mind until..."
Tensing at the surge of memories, Nevara stood in grim silence for a moment before she continued, "Until he could not tell which souls were evil and which were not. By the time it became apparent that he had lost control, it was too late. 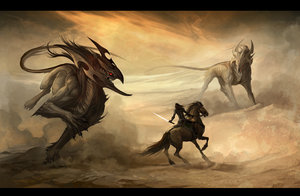 We battled, and he fled to the mortal world, a villain as terrible as any we have ever faced. I failed him." "A rogue vampire...," Brother Light shook his head bitterly, "I might have known this would happen; the cursed are the first to fall under the influence of evil... this is tragic news." 'Damnit Vincent...,' Knuckles looked away, throwing a punch that laid a crack in a nearby wall as he muttered under his breath, "Why...?" 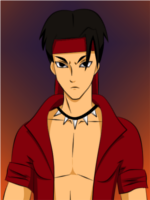 "Where is Vincent now?," Tal broke the chain of negativity with a more decisive sentiment. "I followed Vincent for a time," Nevara admitted, "I believed that, even if I could not save him, I could keep his taint from infecting the world, but an evil more powerful still intervened, and I lost track of him inside the mountain castle to the east. Based on the rumors I have heard, this place belongs to a terrible sorcerer known as Nathaniel Grassroot. This sorcerer is famed for his ability to manipulate others, and our fallen comrade was unstable to say the least when I lost his trail. I fear the worst." 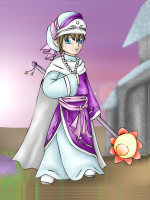 "I am certain of it," Brother Light nodded firmly, "This is the same presence I felt at Eavendale." "Trust the priest we should," Tal stepped forward, "Predict, he did also, the coming of Vektor." "That's true," Knuckles admitted, suddenly blushing at Cellus holding his arm, "Um... I'm okay. Just a scratch." A look of concern came across Cellus' face, "Are you sure, you hit that wall pretty hard, let me see it," she said in her quiet tone, trying to examine Mason's arm. Burk gave a hearty laugh at this, "Give it up, Knux. Once Nurse Cellus is on the job, Hell freezing over couldn't stop her. Speaking of which... we still haven't figured out a way to get into that castle." 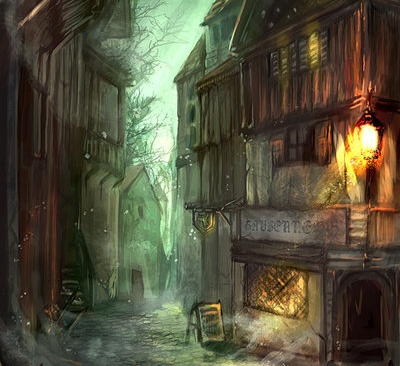 "Such things are better planned by clear heads in the safer hours of the day," Brother Light advised, "Perhaps, for tonight, we should seek shelter from the evils that lurk the streets of this haunted town." "Uh... yeah, what he said!," Knuckles wrenched himself away with a nervous laugh and went running into the pub, "Ale and beef, here I come!" "A man after my own heart," Burk grinned and ran in after, his ponderous blade clanging loudly on his back. Cellus frowned, crossing her arms a letting out an angry sigh, "Don't think you got out of an examination, Mason!" she called after the man, following the pair. 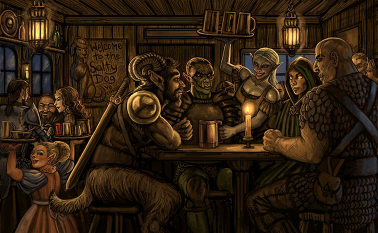 The tavern was a surprisingly lively place, with an even more surprising diversity of races inside. Elves, humans, and dwarves made up the bulk of the crowd, but more exotic creatures such as satyrs and pixies were scattered throughout. If the heroes hadn't seen the town outside for themselves, they might have thought it a nice place to live. Cellus looked around the bar and whistled, she had never seen so many different kinds of people in the same place before. "Welcome to Marrowbrook," the barmaid smiled at Knuckles as he approached her, "Can I get you anything?" "Hook me up with some of that ale!," Knuckles belted cheerfully as he found a place to sit down. "Oh my," the barmaid's smile grew less professional as she saw the three grasslanders enter the pub, "Tal Kadorin, is that really you...?" "Hai," Tal put a hand behind his head and laughed, "Heard I was missed, I did." "True that," the barmaid smiled with a wink, "I'm glad your friends got you home in one piece." With that, she strutted off into the kitchen, humming as she went. 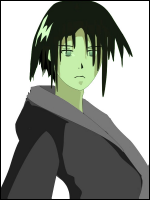 A wave of jealously swept across Cellus' face as she stepped up next to Tal, "Another friend, I suppose?" she asked, her voice full of a mix of cold anger and sarcasm.